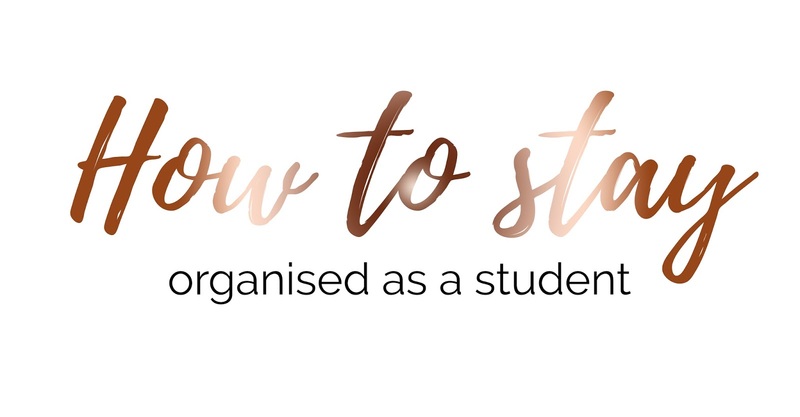 While I was asking my readers what sort of student themed posts they would like to see here on Kimberley Jessica, I had a suggestion of how I stay organised as a student. I'm a generally organised person anyway whether this is my general life, student life or life as a blogger; I like to know what's planned, what I need to do and when I'm going to do it and I've found always asking these questions about every situation is the way I stay organised. Of course I also use a heck load of pretty colourful stationery with lots of notepads and to-do lists, but then, who doesn't? 1. Buy and use a diary! I have to stay a diary has changed everything for me and I use one for absolutely everything. If I know I have a deadline coming up then I'll jot this in. If I'm given "homework", I'll write this in on the day I'm given it and then write when it needs to be done by. I'll then jot in everything I'm doing during every week so I know when I'm able to spend a full day just doing any of my uni work. Use a diary wisely and you'll never live without one again. I know time is a real struggle for many people and to be honest it is for me a lot of the time. I know the day after University I have two following days off, I then work for two days and then have the weekend off before going back to University. This means I have four full days where I can do whatever I want and in most cases, I do everything that I want to do! I'll ensure I spend a day or two doing University work. I'll set myself goals throughout these two days, and if I tick off all my goals, I'll then do something else, this is either blogging or Sims 4! I'll then spend a day over the weekend blogging and just having a "rest day" and usually my last day will be spent with my boyfriend. If not, this will also be spent doing Uni work. I cannot stress how important it is to plan. Plan your time! Know when you have a spare hour in the day and also plan what you're able to get done in that hour. I like to write to-do lists for my uni work for each module, and I'll know roughly how long each part will take on my list. If I have enough time in the day, I'll get cracking with something for my essay because I know I can stop at any point. It's also nice knowing that you have a spare hour in every day to add a little bit more to your work. I know last year I had my word count and I split this up and divided it by how many days I had to complete my work and that gave me a goal of how many words to write each day and it truly worked! Lastly, remember to stay motivated! Start the day off by doing something you enjoy. So today I started my day off waking up next to my boyfriend; something which I absolutely love. However, I did have to come home but it definitely made me happy. I then came home, had a cup of coffee, dealt with my new puppy and now I'm writing this blog post (because I'm terrible and left it till the last minute). I know that the four things I've done this morning bring joy to my life and put me in a positive mind set. So later I'm going to continue to write my draft essay and watch Breaking Bad. I'll always make sure something I love is going on in the background, whether this is tv or even music. I do sometime put Sims 4 on as well and get my Sims to live for themselves for a bit. Anything counts! Start your day off with a positive mind set and you'll be ready to conquer the world. Do you struggle to stay motivated and organised as a student? i love this post! i always buy diaries as an attempt to make me more organised but i literally always forget about them and waste them hahaha. i really need to be more motivated!